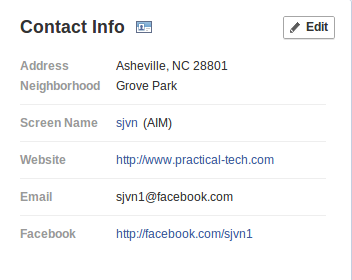 You may not have noticed it, but Facebook switched your default e-mail address to your Facebook e-mail address over the weekend. What? You didn't know you had a Facebook address? Well you do now! What did you do with my e-mail address Facebook! Come on Facebook! Isn't it enough that you make securing my Facebook account a game that's even more annoying than the social games you're constantly pushing on me? Did you really have to silently change my default e-mail address—along with your other 900-million plus members—to my never, ever used facebook.com address without any warning over the weekend? I'm willing to bet that most of Facebook's 900+ million members didn't even know they had a Facebook.com e-mail address. Today, I suspect most of them still don't know that, but over the weekend Facebook changed each and everyone's default e-mail address on their Facebook profiles to their almost certainly never-ever used Facebook address. In short, if someone tires to send you e-mail using your Facebook address it goes into the black hole of Facebook e-mail. Markham was not amused. Good question. Facebook claims that they told everyone about this change in an April. That announcement, about how e-mail addresses would be handled in Facebook timeline doesn't say that it's going to hide the address you've chosen to use. To me, this is just example of how little Facebook cares about its users. Fortunately, changing your e-mail back isn't that hard. Just go to your profile--https://www.facebook.com/YourUserID/info--and click "Update info." Then, scroll down to "Contact Info,” which will be on the right-hand side, and click "Edit." You can then add or pick which e-mail address you want to show on your Timeline, or, for that matter if you want to show any e-mail address on Facebook. That done, simply click save and your friends will now see your preferred e-mail address. Considering how “nice” Facebook is about changing how it handles your information you may want to reconsider keeping any information on it. Me? I still use Facebook because a lot of my old friends and family are on it, but Google+ is my social network of choice. They don't play games with my information and privacy. Facebook is always jerking me around and I'm getting sick and tired of it. How stupid do you have to be to think you’ll have privacy on Facebook?